The mitral valve regurgitation (MR) can be a congenital defect as part of endocardial cushion defect, or it can be an acquired structural disease or a functional impairment of the mitral valve (MV). The acquired causes of MR include rheumatic heart disease, senile degeneration of the MV leaflets, rupture of papillary muscle, and elongation or rupture of the tendinous chord(s). Rheumatic MV disease is the most common cause of MR in young patients. Some degree of MR almost invariably coexists in patients with rheumatic mitral stenosis. Degenerative MR is often caused by myxomatous degeneration of the MV leaflets, fibroelastic deficiency, and senile calcification of the valvular apparatus. In infective endocarditis leaflet perforation or chordal rupture or impaired valve closure due to vegetations on valve leaflets cause MR. Ischemic heart disease is the leading cause of functional MR. Papillary muscle rupture in acute myocardial infarction (MI) and left ventricular (LV) remodeling following MI are the important causes of functional MR. Some of the rarer causes of MR are connective tissue disorders (Marfan syndrome, Ehlers–Danlos syndrome, and systemic lupus erythematosus), myocardial diseases (cardiomyopathies, sarcoidosis, and amyloidosis), trauma, and cardiac tumors. Mild MR occurs in more than one in five adults., The MV-prolapse (with or without MR) can be found in 1–3% of the population. Among all the causes of MR, mechanism of the functional MR is most intriguing and interesting, and its sound understanding helps understanding mechanisms of MR in other clinical situations. The MV is a sophisticated natural engineering marvel. The MV requires coordinated action of all its interrelated anatomical components: The left atrium (LA), the MV leaflets, the annulus, the chords, and the papillary muscles with its surrounding LV wall for an effective closure of the MV orifice. The MV closes as soon as LV pressure exceeds the LA pressure, and the closure occurs within moments of the initiation of LV systole. Dynamic changes such as a decrease in the MV annulus-size, increase in transmitral gradient, papillary muscle contraction and controlled restraint of MV leaflets by the tendinous chords occur during systole. A large area of coaptation between anterior and posterior mitral leaflets (AML and PML) provide a significant reserve against regurgitation. A small displacement volume is always associated with MV closure and can be detected by Doppler techniques; therefore, one should be cautious before labeling this small regurgitation as an expression of an ongoing disease process. During systole, the transmitral pressure gradient and sphincter mechanism of MV (leaflets and annulus) tend to close MV. 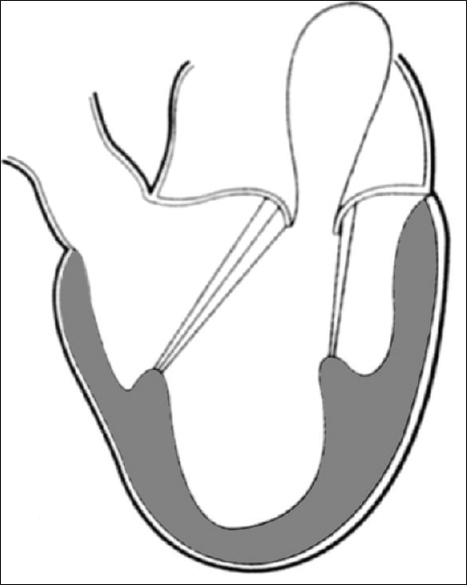 These actions are supported by simultaneous coordinated tensor action of the papillary muscles on tendinous chords that keep the mitral leaflets below the level of mitral annulus thereby ensures sufficient area of coaptation among both leaflets and do not allow their prolapse into the LA. It is intuitive that MR is likely, if the annulus is dilated or its sphincter mechanism is interfered, or there is insufficient increase in transmitral gradient or there is defect in the coaptation between AML and PML or there is impaired function of the tendinous chords due to their rupture, elongation or tethering, or the mitral leaflets are damaged. The most common causes of MR include ischemic heart disease, nonischemic heart diseases, and valve degeneration. Both ischemic (coronary artery disease) and nonischemic heart diseases (e.g., idiopathic dilated cardiomyopathy) cause "functional" MR via multiple different mechanisms including impaired LV wall motion, LV dilatation, and papillary muscle displacement and dysfunction. In contrast, degenerative ("organic") MR is caused by structural abnormalities of the valve leaflets and the subvalvular apparatus, including stretching, or rupture of tendinous chords. 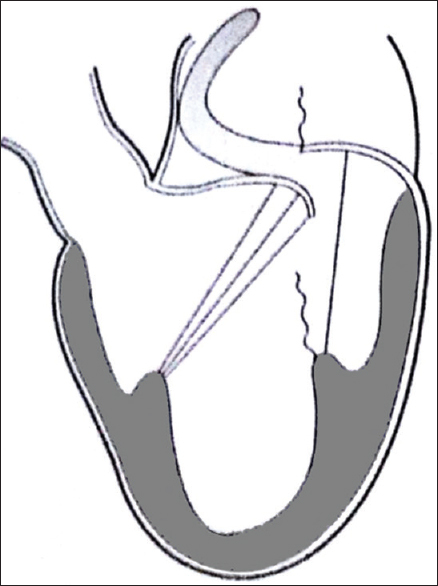 The precise mechanism of functional mitral regurgitation remains unclear; the factors described above can be grouped as those causing: (1) Abnormally increased tension on the leaflets caused by displacement of the papillary muscles or annular dilatation, restricting leaflet motion toward closure,,,,,,,, and those causing (2) decreased global LV systolic function, decreasing the transmitral pressure force acting to close the mitral leaflets. MIs involving the inferolateral and the posteromedial papillary muscles produce tethering of the mitral leaflets that prohibits normal coaptation, leading to "functional" MR even though the valve leaflets themselves are normal. Ventricular dilatation secondary to ischemic myocardial dysfunction or volume overload also cause apical displacement of papillary muscles, tether the valve leaflets and prevent the effective closure of the MV. However, an increased myocardial contractility and ensuing high transmitral pressure can overcome the tethering of leaflets and decrease/prevent the MR. The dynamic nature of the regurgitant orifice which decreases as the LV contracts further complicates elucidation of the mechanisms of MR. Apparently, functional MR in patients with ischemic or dilated ventricles is related to LV dilatation causing altered tension on the leaflets due to displacement of papillary muscles restricting leaflet closure, and global ventricular dysfunction decreasing LV systolic and transmitral pressure preventing effective closure of the leaflets. MR can be classified according to its etiology or according to pathophysiologic mechanism leading to regurgitation. Carpentier  described the presently used classification of MR based on leaflet motion. The MR is usually the result of annular dilation; the movement of the leaflets is normal [Figure 1]. The MR tends to be central. The other causes of central MR include mitral leaflet cleft, aneurysm of the leaflet, and perforation or destruction of the leaflet(s) due to endocarditis. MR is due to excessive movement of the leaflets; the MR is directed away from the diseased leaflet. Normally the coaptation point between AML and PML remains below the MV annulus. In type II MR, the tip of the affected leaflet prolapses above the level of the annulus during systole [Figure 2]. 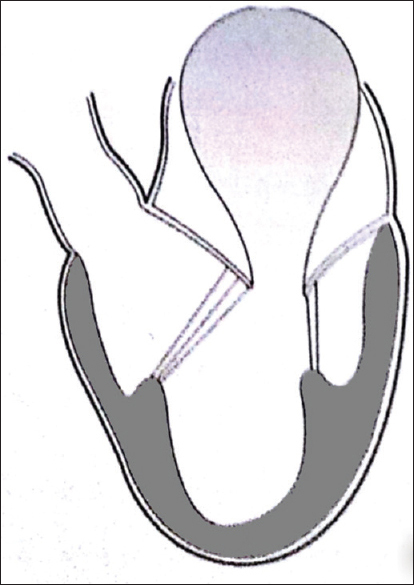 The term flail describes free-floating of the edge of a leaflet in the LA during systole because of rupture of one or several tendinous chords. MR is due to leaflet tethering (restricted movement) either due to disease of the tendinous chords as occur in rheumatic heart disease (IIIa) or due to displacement of papillary muscles secondary to dilation of the LV (IIIb). In type IIIa MR, the movement of the leaflet(s) is affected in both systole as well as diastole whereas in type IIIb MR, the movement of the leaflets is affected during systole due to dilation of LV and/or displacement of papillary muscles that prevent appropriate coaptation of the leaflets [Figure 3]. The MR is also described, as functional MR. The leaflet motion in diastole is normal. The dilation of LV and/or displacement of papillary muscles can occur due to ischemic heart disease or in situ ations that result in LV volume overload such as aortic regurgitation, ventricular septal defect, and patent ductus arteriosus, etc. The MR jet direction depends on leaflet involvement, if both leaflets are affected, MR is central and if only one leaflet is affected, MR is eccentric. Since, each papillary muscle send chords to both papillary muscles, ischemic MR is usually central. In the presence of MR, during systole, LV empties into the low-pressure high compliance LA as well as into the high-pressure and high-resistance systemic circulation. The volume of regurgitation in to LA depends on the size of the regurgitant orifice, transmitral gradient (LV-LA gradient), LA size and its compliance, pulmonary vascular compliance, systemic vascular resistance, LV volume, and duration of systole. Increases in peripheral vascular resistance, LV volume, and duration of systole (bradycardia) increase the regurgitant fraction whereas decreases in all these variables decrease regurgitant fraction. Patients with mild to moderate MR may remain asymptomatic with little or no hemodynamic compromise for many years; however, MR from a primary MV abnormality tends to progress over time with an increase in volume overload due to an increase in the effective orifice area. Progression of the MR is variable and determined by the progression of lesions or mitral annulus size. 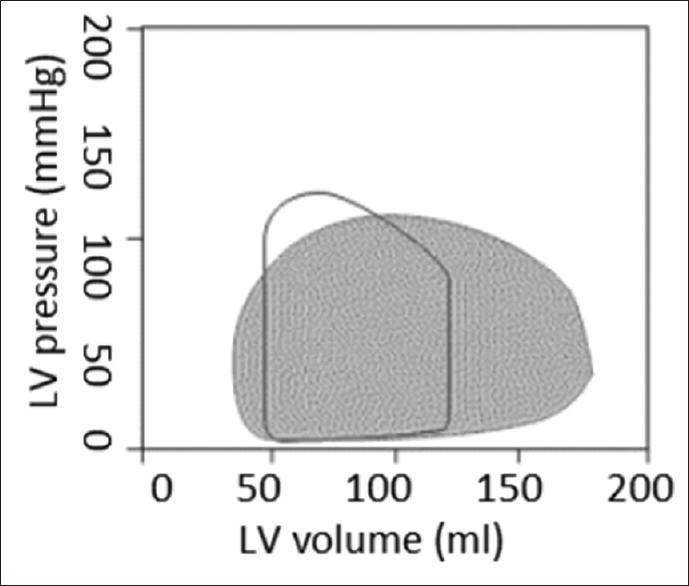 The pressure-volume relationship in presence of MR is shown in [Figure 4], the shape of the pressure-volume loop is abnormal, the area of the loop and the end-diastolic volume is grossly increased, there is absence of isovolumic contraction phase and the LV volume starts decreasing as soon as the LV starts to contract. The role of the transmitral gradient is contradictory in ischemic/dilated cardiomyopathy and in clinical situations where the regurgitant orifice is fixed due to structural disease. In situ ations where the regurgitant orifice is fixed, an increase in transmitral gradient increases MR. In ischemic cardiomyopathy, decrease in myocardial contractility results in LV dilation, mitral annular dilation, tethering of MV leaflets, decreased transmitral gradient, and MR. Therefore, an increase in myocardial contractility, though, increases the transmitral gradient but decreases the LV size, annulus size, and tethering effect on MV leaflets, and therefore, decreases MR. The MR results in volume overload of the LA and LV. The chronic LV volume overload in MR results in increasing annular dilatation that leads to cascading effect and further increases in MR that is why the terminology "MR begets MR." In the early stages of chronic MR, the LV systolic and diastolic functions are usually preserved. However, during later stages, LV systolic dysfunction is almost universally present and is typically masked by its unloading into the highly compliant LA; therefore, the load-dependent measures of systolic ventricular function such as ejection fraction (EF), significantly underestimate the severity of myocardial dysfunction. Diastolic function is frequently impaired in advanced stages of MR as the LV becomes less compliant and filling pressures increase. Over a period, chronic LA-LV volume overload results in pulmonary hypertension, right ventricular hypertrophy, septal flattening, tricuspid regurgitation, systemic and pulmonary congestion, and symptoms of backward failure. Large and compliant LA and pulmonary vasculature delay development of symptoms of backward failure by preventing increases in LA pressure. The regurgitant fraction determines the distribution of stroke volume (blood volume ejected in the systemic circulation and in the LA). With deterioration in systolic function or increases in the regurgitant fraction, forward failure occurs. It is now recognized, that some of the etiologies leading to structural changes of the MV apparatus also affect the tricuspid valve. Thus, in patients with MV disease, often some degree of tricuspid regurgitation can be found. In acute MR due to trauma, acute inferior or inferolateral wall MI or papillary muscle rupture, no compensatory mechanisms, and structural changes are present, and the regurgitant volume is imposed on a normal sized LA that causes a steep rise in LA pressure. Patients with acute MR present with symptoms of LV failure such as acute pulmonary edema, dyspnea, chest pain, and cardiogenic shock. Biventricular failure usually ensues secondary to acute volume overload and markedly elevated LA pressures. The indices of systolic function of myocardium such as EF, fractional fiber shortening, and circumferential fiber shortening are inversely related to LV afterload. In the early stages of the disease, the LV afterload is decreased because of simultaneous emptying of LV in low-pressure LA and systemic circulation; therefore, the systolic function indices are usually normal or increased. In spite of normal systolic functions, many patients at this stage develop symptoms because of increase in LA pressure and backpressure effects. However, as the disease progresses, there is increase in the LA pressure, pulmonary venous pressure, and pulmonary arterial pressure, concomitantly, the LV systolic function deteriorates, these changes result in deterioration of systolic indices of LV function. Therefore, low normal indices of systolic function represents severely reduced and often irreversible impairment of LV contractility. An EF of <0.35 in patients with MR usually represents advanced myocardial dysfunction and such patients are high-risk for surgery and may not show improvement after MV repair or replacement. The end-systolic volume or diameter has been found to be a useful predictor of function and survival, and a diameter of <45 mm or 26 mm/m 2 indicates good outcome after MV surgery. The patients with chronic MR usually remain asymptomatic for a long period; however, MR is not a benign disease and studies have shown a significantly increased morbidity and mortality in patients with MR., The clinical features of MR are related to its mechanism and pathophysiology. Symptoms can be acute in the acute myocardial ischemic event, or evolve over time as the underlying disease progresses. In patients where MR is related to ischemic heart disease and LV dilatation, the features of ischemic heart disease, and congestive heart failure coexist whereas in patients of MR secondary to structural disease of the MV, the symptoms of both raised LA pressure, pulmonary venous, and pulmonary arterial hypertension or low cardiac output manifest. The manifestations of features of raised LA pressure are related to the compliance of LA and pulmonary vascular bed. In patients, where LA is large and compliant, LA pressure, pulmonary venous and pulmonary arterial pressure do not increase markedly, and the symptoms of forward failure dominate; in patients where LA is small and poorly compliant, the features of raised LA pressure dominate. The clinical features occur in spite of normal LV systolic function. Chronic MR is usually well tolerated until the compensatory mechanisms fail, and patients present with symptoms of forward failure such as fatigue, decreased exercise tolerance, and increasing shortness of breath. The symptoms may be triggered by the new onset of atrial fibrillation. Symptoms in MV-prolapse can be related to MR; however, patients may be symptomatic even without MR due to an increased prevalence of autonomic dysfunction. General physical examination, cardiac auscultation, electrocardiogram (ECG), radiological examination, and echocardiography are the key evaluations. The presence of a pansystolic murmur with radiation in left axilla strongly suggests the presence of MR. The handheld pocket ultrasound monitors could instantly confirm the presence of MR and is an alternative to the auscultation methods. The ECG in MR shows features of LA and LV enlargement. In association, there can be features of myocardial ischemia particularly in left anterior or circumflex artery territory. In evaluating the severity of the MR, it is desirable to determine regurgitant orifice area as well as regurgitant volume and fraction. Further, it is important to assess the LV size and its function to aid the decision toward repair or watchful waiting. Transthoracic echocardiography (TTE) imaging is the mainstay of diagnosis and evaluation. With advances in TTE imaging techniques, cardiac catheterization is rarely required in the diagnostic evaluation of MR.
Mittnacht AJ, Fanshawe M, Konstadt S. Anesthetic considerations in the patient with valvular heart disease undergoing noncardiac surgery. Semin Cardiothorac Vasc Anesth 2008;12:33-59. Singh JP, Evans JC, Levy D, Larson MG, Freed LA, Fuller DL, et al. Prevalence and clinical determinants of mitral, tricuspid, and aortic regurgitation (the Framingham Heart Study) Am J Cardiol 1999;83:897-902. Freed LA, Levy D, Levine RA, Larson MG, Evans JC, Fuller DL, et al. Prevalence and clinical outcome of mitral-valve prolapse. N Engl J Med 1999;341:1-7. Muresian H, Diena M, Cerin G, Filipoiu F. The mitral valve: New insights into the clinical anatomy. Mædica J Clin Med 2006;1:80-7. Pedrazzini GB, Faletra F, Vassalli G, Demertzis S, Moccetti T. Mitral regurgitation. Swiss Med Wkly 2010;140:36-43. Burch GE, DePasquale NP, Phillips JH. The syndrome of papillary muscle dysfunction. Am Heart J 1968;75:399-415. Godley RW, Wann LS, Rogers EW, Feigenbaum H, Weyman AE. Incomplete mitral leaflet closure in patients with papillary muscle dysfunction. Circulation 1981;63:565-71. Boltwood CM, Tei C, Wong M, Shah PM. Quantitative echocardiography of the mitral complex in dilated cardiomyopathy: The mechanism of functional mitral regurgitation. Circulation 1983;68:498-508. Kono T, Sabbah HN, Rosman H, Alam M, Jafri S, Stein PD, et al. Mechanism of functional mitral regurgitation during acute myocardial ischemia. J Am Coll Cardiol 1992;19:1101-5. Kono T, Sabbah HN, Stein PD, Brymer JF, Khaja F. Left ventricular shape as a determinant of functional mitral regurgitation in patients with severe heart failure secondary to either coronary artery disease or idiopathic dilated cardiomyopathy. Am J Cardiol 1991;68:355-9. Sabbah HN, Kono T, Rosman H, Jafri S, Stein PD, Goldstein S. Left ventricular shape: A factor in the etiology of functional mitral regurgitation in heart failure. Am Heart J 1992;123 (4 Pt 1):961-6. Kono T, Sabbah HN, Rosman H, Alam M, Jafri S, Goldstein S. Left ventricular shape is the primary determinant of functional mitral regurgitation in heart failure. J Am Coll Cardiol 1992;20:1594-8. Sabbah HN, Kono T, Stein PD, Mancini GB, Goldstein S. Left ventricular shape changes during the course of evolving heart failure. Am J Physiol 1992;263(1 Pt 2):H266-70. Kaul S, Spotnitz WD, Glasheen WP, Touchstone DA. Mechanism of ischemic mitral regurgitation. An experimental evaluation. Circulation 1991;84:2167-80. Levine RA, Schwammenthal E. Ischemic mitral regurgitation on the threshold of a solution: From paradoxes to unifying concepts. Circulation 2005;112:745-58. Schwammenthal E, Chen C, Benning F, Block M, Breithardt G, Levine RA. Dynamics of mitral regurgitant flow and orifice area. Physiologic application of the proximal flow convergence method: Clinical data and experimental testing. Circulation 1994;90:307-22. Carpentier A. Cardiac valve surgery – The "French correction". J Thorac Cardiovasc Surg 1983;86:323-37. Enriquez-Sarano M, Tribouilloy C. Quantitation of mitral regurgitation: Rationale, approach, and interpretation in clinical practice. Heart 2002;88 Suppl 4:iv1-3. Enriquez-Sarano M, Basmadjian AJ, Rossi A, Bailey KR, Seward JB, Tajik AJ. Progression of mitral regurgitation: A prospective Doppler echocardiographic study. J Am Coll Cardiol 1999;34:1137-44. Thomas SJ, Lowenstein E. Anesthetic management of the patient with valvular heart disease. Int Anesthesiol Clin 1979;17:67-96.